As health supplement to help support growth and development of teens. May help boost immune system, enhance mental development, and promote growth. 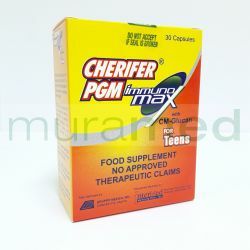 CM-Glucan 5 mg, Chlorella Growth Factor (CGF) 200 mg, Taurine 200 mg, Dicalcium phosphate 150 mg, Vit. C 97.5 mg, Vit. B3 24 mg, elemental Iron 20 mg, elemental Zinc 9 mg, Magnesium oxide 7.5 mg, Vit. A acetate 1,925 IU, Vit. D3 210 IU, Vit. B2 1.95 mg, Vit. B6 1.95 mg, Vit. B1 1.8 mg, Copper sulfate 1 mg, Folic acid 600 mcg, Vit. B12 3.6 mcg. Recommended Use for adults and teens: Take 1 capsule once a day, or as recommended by a health professional. Precaution: Do not take more than the recommended dose. Possible side-effects: Rarely, gastrointestinal and allergic reactions. This product should not be given to patients with known hypersensitivity or allergy to any of its components. Also sold per box (30 capsules).